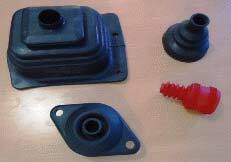 We are ranked among well-established Rubber Bellows’ Manufacturers, Exporters and Suppliers. We make them from superior-grade raw materials and the latest CAD/ CAM technologies. Hence, our Rubber Bellows are resistant to all external influences such as oil, grease, dirt, dust, abrasives and weld splatters. We offer them in varied specifications and cater to customizations requests. Buyers can get Rubber Bellows from us at competitive prices.